If you want to know how to take a child to wipe their bottom, we’ve got you covered. Toilet training can be an exciting and stressful time for children and parents. While the idea of ditching the diapers and sporting big kid underpants is a right of passage many children look forward to, others aren’t so keen. There can be so many reasons a child resists toilet training – fear of sitting on a toilet, a stressful experience with an automatic flusher in a public restroom, sensory sensitivities, life events like the birth of a sibling or loss of a parent or loved one, poop withholding, and power struggles are common examples – which can be extremely challenging to overcome. Regardless of whether you toilet train your child in 3 days when he or she is only 18-months-old, or you’re still struggling with potty training woes leading up to your child’s first day of kindergarten, the reality is that each child is different. There is no ‘one size fits all’ approach to toilet training, and even when your little one gets the hang of peeing and pooing independently, figuring out how to teach a child to wipe their bottom is an entirely different beast! Teaching a child how to wipe themselves after using the bathroom isn’t as simple as it seems, and we’re excited to share 15 tips and ideas to help make the process as simple (and fun) as possible. At What Age Should Kids Be Able to Wipe Their Own Bottom? In a perfect world, we would be able to teach a child to wipe their bottom at the same time we toilet train them, but the reality is that most kids don’t have the manual dexterity needed to wipe themselves properly at such a young age. So while we can certainly get a head start by showing our kids how it’s done and allowing them to give it a try, be prepared to continue wiping your child’s bottom long after you toss the diapers. With that said, most schools require kids to be toilet trained and able to wipe their own bottom by the time they start kindergarten (which starts at age 4 here in Canada), so that’s a good age to aim for. Keep in mind that your child may not be 100% successful in wiping their own bottom by this age, but as long as they are doing their best, using the right technique (wiping from front to back), and you’re enforcing proper hand hygiene, you’re setting them up for success. Dig deeper. One of the best parenting tips I’ve learned over the years is to always look beneath the surface when it comes to figuring out the motivation behind a child’s behavior. I often talk about The Iceberg Model, which suggests that the challenging behaviors we see in our children are only the ‘tip’ of a much bigger iceberg. And since only about 10% of an iceberg is visible to the naked eye, The Iceberg Model theorizes that the drivers behind our child’s behaviors live beneath the surface, and that we must find a way to see and understand these drivers before change can occur. The idea is to track the same behavior multiple times to determine if there are any consistencies, and then formulate a plan to change the antecedent and/or consequence to ensure the behavior (refusing to wipe) stops happening. You can also use this tool to determine if the antecedent and/or consequence is out of your child’s control (does your child have the manual dexterity needed to perform the movements? does he or she have sensory challenges that make the idea of wiping unbearable? ), if it’s an emotional challenge (is your child reluctant to give up the attention you give to him/her after successfully having a bowel movement on the toilet? ), or if your child is just being difficult and engaging you in a power struggle. Educate. Another great parenting tip I once read is to stop assuming our children know what’s expected of them, and to take the time not only to explain the steps involved in certain tasks (in this case, wiping their own bottom), but why we need to do these things in the first place. A one-on-one conversation with your child in a safe and quiet space that is free of distractions will not only allow you to explain to your child why you want him or her to learn how to wipe their own bottom, but will also give him or her the opportunity to explain any fears or difficulties he or she may be having. Use positive reinforcement. Reinforcement is a fabulous technique parents can use to encourage the behaviors they want to see in their children, and research tends to suggest that positive reinforcement – the act of rewarding a child when he or she completes a desired behavior as a means of increasing the likelihood he or she will repeat the behavior again – is the most effective. This can come in the form of praise, or you can take it a step further and develop a sticker chart to make things extra motivating for your child. This post contains a list of all kinds of fabulous reward charts you can use to positively reinforce your child’s behaviors. Is your child ready? If you’re trying to figure out how to teach a child to wipe their own bottom, the first thing you need to confirm is if they are up to the task. As mentioned earlier, young kids often don’t have the manual dexterity needed to wipe themselves, properly. If this sounds like your child, a great option is to have them practice, but to finish the job for them. This way you’re setting them up for success, but you’re still supervising until they are 100% ready for the job. Demonstrate. As with all things related to parenting, don’t assume your child knows how to wipe his or her own bottom, and remember that watching isn’t the same as doing. Take the time to demonstrate the process to your child, and guide your child’s arms and hands so he or she understands what needs to be done. Explain the rules. This is particularly important for girls as incorrect wiping can lead to a UTI, which can be very painful and uncomfortable. Explain to your child the importance of wiping from front to back, remind him or her to continue wiping until the toilet paper is clean, and to use fresh toilet paper for each wipe. Get silly. One of my favorite parts about being a parent is that it allows me to find ways to make even the most unpleasant tasks fun. If you’re trying to figure out how to teach a child to wipe their own bottom and have no idea how to get started, a fun first step is to get silly with it. Grab some paper plates, Nutella, and toilet paper and have your child practice wiping the Nutella off the paper plates so he or she can better understand how much toilet paper to use for each wipe, and how to tell when the job is done. You can also use chocolate mousse or peanut butter, LOL. Once the initial technique has been mastered, fold the plate such that your child has to get inside the…crevices. You can get even sillier by taping the plate to his or her bottom for a little more of an accurate test run! Provide a visual. When you’re first figuring out how to teach a child how to wipe their own bottom, it’s a great idea to create some sort of visual to help prompt and remind your child what the different steps are, and in which order they need to be completed. This doesn’t need to be complicated – you can create a simple visual schedule using clip art for younger children, or simply write out the steps by hand for older kids. Just make sure to hang the instructions close to the toilet for easy reference when your child needs prompting. Provide toilet paper guidelines. Teaching kids how much toilet paper to use when wiping their bottom can be tricky. If they use too much and have to wipe multiple times, they can clog the toilet, but if they use too little, it can be pretty unsanitary! Work together to find a way to measure out the correct amount of toilet paper to use per wipe, and remind your child to flush every 2 wipes to ensure you aren’t left with a blocked toilet. Use wet wipes. Wet wipes are a fabulous tool to use when teaching a child how to wipe their own bottom. Not only is it stronger than most toilet paper, but it’s easier to use, doesn’t leave behind debris, and results in a cleaner bottom. Amazon sells flushable wipes (I like these scent-free Mickey and Minnie Mouse ones by Cottonelle), but if you’re worried about your little one getting into the habit of putting all kinds of wipes and paper products into the toilet, it may be better to have them throw wipes in a waste basket. Do a post-wipe check. As much as you may want your bum-wiping years to be over, it’s important that you continue to do checks until your little one is doing the job successfully. Be sure to provide feedback during these checks to help your little one get better at the task, and remember to keep things positive for continued success. Don’t compare your child to others. I think this is important advice for all areas of parenting! Remember that every child is different and will develop at his/her own pace, and be careful not to compare your little one to his or her peers. Keep the experience light and positive, offer lots of praise, and provide feedback for ongoing success. Stay calm. Teaching a child how to wipe their own bottom isn’t for the faint of heart, but it’s important to keep things in perspective. If you become angry and irritable and show feelings of disgust during the process, you will inadvertently create a negative association with all things toileting for your child. Embrace the process and find ways to keep your sense of humor about you, and remember that the short-term pain is worth it for the long-term gain! Enforce proper hand hygiene. If you’re trying to figure out how to teach a child to wipe their bottom, you need to come to terms with the fact that it’s going to be a messy – and sometimes unpleasant – process. Your child won’t always use enough toilet paper and will likely have dirty underpants from time to time, which is why it’s so important to ensure you teach your little one proper hand hygiene. We’ve written a fun post with tips for teaching kids about germs, and how to demonstrate the importance of proper hand washing, which you can read HERE. You may also want to display a hand washing visual at each of the sinks in your house to really drill the point home with your kids! I hope this collection of tips and ideas helps you on your quest to figure out how to teach a child to wipe their bottom. Remember to be realistic and patient, to provide positive feedback, to keep things fun, and to enforce proper hand hygiene! 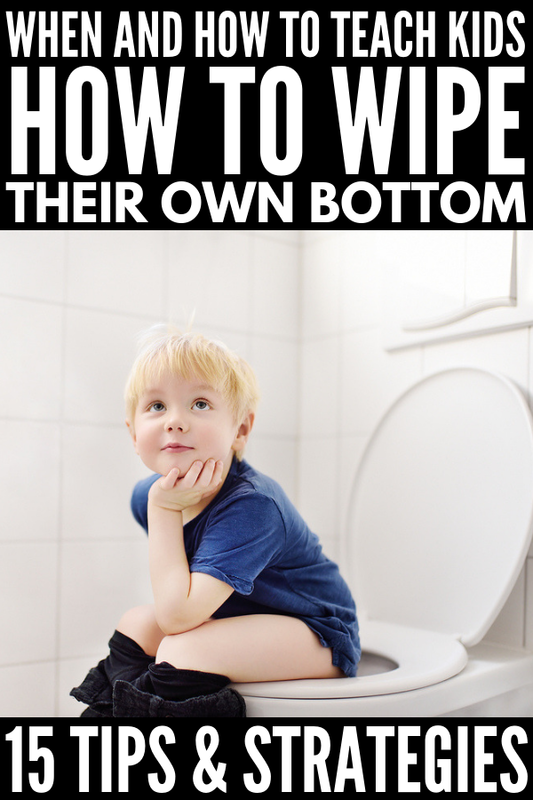 If you found this tips and ideas helps you on your quest to figure out how to teach a child to wipe their bottom helpful, please share this post on Pinterest! And if you’re looking for more parenting advice, please follow our Parenting board where we share all kinds of great ideas we find each day!